What draws us to places so different? Is it the fascination with oulandish juxtaposition? Anyone can feel clever as they experience the coarse aesthetic of cultures interacting. It’s too easy. A lot of times it’s just cheap profundity, although mightily entertaining. Another example: Vending machine message found in the Rapongi District of Tokyo, an area that comprises one of the most valuable, modern pieces of real estate in the world. 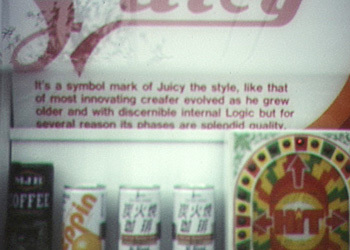 It’s a symbol mark of Juicy the style, like that of most innovating creafer, evolved as he grew older and with discernible internal Logic but for several reason its phases are splendid quality. How is it that this ever got printed? What a great world!